Prior to starting this blog, one of my favorite time savers was cooking in aluminum foil pans or lining a pan with tin foil for an easy clean up. Since starting this blog, I have been introduced to cooking with glass. Now I line the pan with parchment paper instead of foil. I am happy to say, the clean-up is not too difficult, and I have the pleasure of feeling like I am cooking more healthfully. In general, I always like to have food available in all food groups, for a well-rounded diet. For the vegetables, I usually steam the or bake them. However, roasted vegetables, while more time consuming, are the tastiest. The other advantage is that I can put them in the oven and attend to other tasks while they cook. Beets are one of our staple vegetables. They are hardy and colorful. As the are so dense, I usually boil them. They also tend to take a long time to cook, even with a pressure cooker. More than once, using a pressure cooker has resulted in many scorched beets and burnt pots. Together with carrots, beets were one of the first vegetables that Yaffa learned to eat. I am not sure if it is because they are sweet, but other than zucchini, Yaffa does not care for green vegetables. I have to sneak them into things. So, I wanted to try roasting beets instead of boiling them. I thought that it would be more flavorful, and, no peeling is required. A potential time saver! However, I wanted to find a way to roast beets without tin foil. I am happy to say, I think that I have developed an easy method for roasting beets without tin foil. Beets, scrubbed and washed well and cut into quarters, depending on the size. The beets can be peeled, but, part of the appeal of roasting beets is that they don’t need to be peeled. Use a roasting pan with a lid. Line the pan with lightly spray oiled parchment paper inside. Place beets in pan and spray oil the beets. Lightly sprinkle salt and other spices on top. 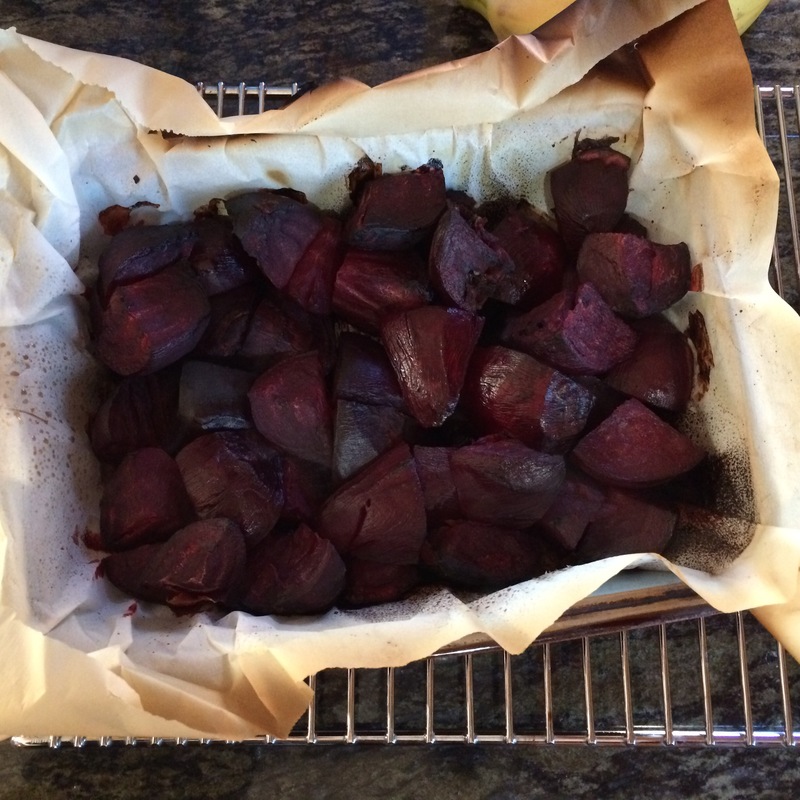 Roast the beets in a 425*F oven, covered, for approximately 1 to 11/2 hours, or until soft. Next, continue roasting without the lid, until they reach the desired roasting. Covering the beets in the beginning , cooks the beets more evenly, without burning the outside, and having the inside still hard. Essentially, the beets are steamed in the oven and then finished off with roasting. Everyone is eating more beets now that I am making them this way. I see you like beets! I do too. But I don’t think too many share our common delight. I don’t think they are too popular either. But, I love their color! And, they are so versatile. Oddly, this is probably one of my most popular recipes. I’ve always used foil, but you’re right – this is so much better. Thanks! Thank you for reading. I like the idea of not using tin foil. And, this works. I’m using it on Thursday for dinner with guests. Thanks! I am so happy! I love the idea of no foil! Enjoy! this looks wonderful and so delicious! I would love to try this Carol! It came out great. From a blogging sister, I just tried microwaving the beet for 10 minutes before roasting. A significant time saver! Roasting any kind of vegetable always make them taste so much better! I love beets. It’s funny you mention about parchment paper vs. foil. I went through the whole thing of trying to make sure that parchment paper doesn’t have any potential toxin issues of its own. I think the thing that makes food not stick on parchment paper is silicon. My mind is so tired. I did this research a while ago and it’s infuriating because the bottom line is it’s best not to have any lining at all. But, please correct me if I’m mistaken. So, I did a search on line. What I found is that there is no conclusive evidence that the silicon used in parchment paper is unhealthy or toxic. The risks of parchment paper seem to center around the chlorine used to bleach the paper, which has environmental hazards. And, some paper used to have quilon, which is also not healthy. Therefore, it is best, if you want to use parchment paper, to buy it unbleached, and quilon-free. Now, assuming you are using healthy and good pots and pans, without Teflon, then it might be best to use nothing. However, then you have to have the time to clean or the resources to pay someone else to clean for you. Everyone needs to evaluate and balance their priorities. I am time challenged, and do not have unlimited resources. Therefore, it is very important for me to be as healthy as possible but still be able to balance my responsibilities at work and home. I try to do the best I can with what I have. After that, I try to surrender and accept what is. Sorry to be so long winded. I think that this is an important topic and I wanted to find out more about it. Yes, it looks like you read the sane stuff I had also found out. The thing I wanted to confirm was whether I can use the Reynolds brand without having to worry. As you know this parchment paper is not cheap so when there is a sale on the Reynolds brand I took advantage of it and then checked to see if this was a good decision. I say oy vay at this time. I too am time challenged and glad to hear your info corroborates with mine. I appreciate your thoughts. I was happy to look it up and find out more. I usually only worry about what’s in front of me. Yes, and I am sure you are then aware that since grill season is upon us, it is a good time to remember to limit grilling because of the dreaded HCAs. However, this is true too for fried and blackened foods and, alas even the roasting in the ovens. The key to limiting HCAs is not to burn your food. If it is blackened or ashy, you might think twice. Sorry to be a party pooper. I love beets in any way or form! Cant’t wait to give it a try ! I had to look up the health effects of using aluminum foil in cooking. I’m new to beets (cooking them myself) so this is a welcome post! I do like the idea of parcooking them in the microwave with a bit of water. Wasn’t there a concern at one time of health effects of microwaves? We just have to do our best, right? I am uncertain about the effects of microwaving food. I think I need to check on it. I went on line and found this link about microwaving food. I think that if you are not heating or cooking your food in plastic, that microwaving food is ok. I use glass bowls with a lid, to avoid plastic. Please let me know what you think. Thanks for looking this up. I think it is the plastic issue. I use glass bowls as well. You are very sweet to look this up. I couldn’t help it. I wanted to know too!😊I hope it’s useful. I love roasted beetroot! So yummy. I often microwave them first for about 10 mins then roast them, as it takes less time in the oven as they are already slightly softened. That’s a great idea! With water? I just cut them into wedges and place on a plate /bowl in the micro with a little water. Although I have forgotten the water before and they were fine. You may have to experiment with the times depending on the wattage of your micro and the amount and size of beetroots. I do this with potatoes too to make wedges prior to placing in oven. No problem. Anything to save time is good. I’ve microwaved beetroots and potatoes, but not any other veg, but I’m sure it would work for others too! I usually cook zucchini in the microwave. I find it is less likely to over cook that way. Thanks, another one add to my list of microwavable veg! I wanted to tell you that I made the roasted beets again, and I microwaved them for 10 minutes before I roasted them in the oven. It cut down the cooking time significantly! That you for that great tip! No problem. Glad that I could help. I love when tips save me time!! Such a big help and time saver. Thank you! Great post.. And way healthier.. Aluminum foil, pots and pans leach aluminum into the food being cooked.. I’ve thrown away all aluminum pots and pans and use stainless steel and ceramic now.. I honestly believe the terrible rise in Alzheimer’s and Autism have a direct link to heavy metals poisoning.. Aluminum is very dangerous ingested.. Cast iron too can leach some iron.. For most ppl its just extra iron in the diet but for some sensitive to iron, it has a possibility to be a problem.. Aluminum isn’t good for anyone to digest.. Anodized aluminum manufacturers claim that thiers doesn’t react to acidic foods, like tomatoes.. I disagree, tomato sauce did react to mine.. I also try to stick to stainless steel and no Teflon. I use cast iron. I always thought it was a great way to get more iron? Plus it cooks great. Hmmmm. Great! Thank you! It sounds so interesting to me. Great concept. More people will be inclined to prepare them this way. They are such a wonderful nutritious product as well. Nice post. I enjoy beets also. 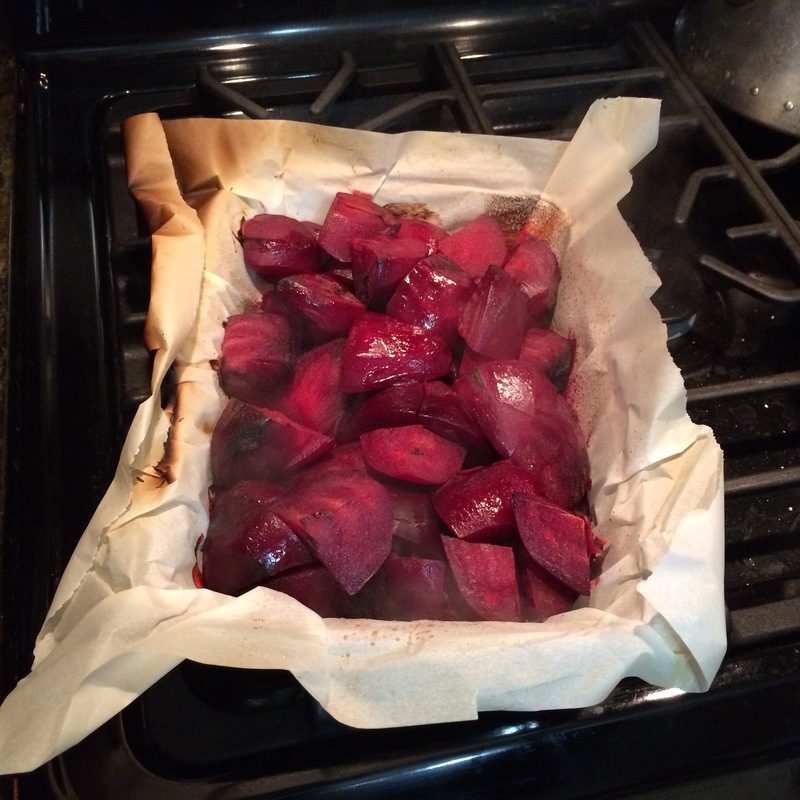 I wonder if you could instead use an oven cooking bag inside the roaster pan to steam and cook the beets faster. We use them for cooking turkey but in theory you can use them for a hard vegetable like beets. Also it is getting warmer here is wonder about roasting on a BBQ, maybe partially boil first? I have roasted asparagus on BBQ and it was tasty. I love beets. I never even thought of roasting them. They look really good. Thanks for sharing this. I will pass this one to wifey. I had never roasted them until recently either. You have a great wife! Bon appetite! Thank you for saying that. Thanks for the idea. I admit, I’ve never made just a side of roasted beets! But I am all on board with your substitution of parchment paper for aluminum foil! They came out great. The first couple of times, I burnt the outside and the insides were still hard. So the trick is to soften them first and then roast. And no tin foil was an achievement!